This year, the MSME Conference grows! The Conference will take place as a part of a larger event, the MSME Week 2017 - a week-long event that will enable Liberian businesses to promote their products, meet customers and engage in training and knowledge sharing. MSME Week will be kicked off on Saturday, November 25th, when the Ministry of Transport with assistance of the European Union and the GIZ will be holding a city activity dubbed: 'Safe Streets Festival’ in Central Monrovia. The week will be concluded on Saturday, December 2nd with a concert at the Liberian Marketplace. All week long, discover events for Liberien entrepreneurs and small businesses throughout Monrovia. You won't want to miss this! As has been the case for 5 consecutive years, the Annual MSME Conference 2017 will be the perfect opportunity for Liberian businesses to showcase their products and for individuals to discover and purchase Liberian-made clothes, innovations and food. The Conference will this year be held at the Liberian Marketplace at the Nancy Doe Market, 8th Street Sinkor, on November 30th & December 1st. All you need to do is apply at https://goo.gl/99vjup to be selected and awarded with a booth to showcase your products. This year's Conference will be held on the theme of ICT innovations. For ICT businesses, the Conference will award 4 prizes of US$ 5,000 each. Categories for prizes are: Agriculture, E-commerce, Education and eGovernment innovations. Application for the contest can be made at https://goo.gl/99vjup. All businesses that apply and are selected to showcase their products, ICT or not, will receive a free two-day training during MSME week, and be provided with a booth at the Liberian Marketplace to present and sell their products. 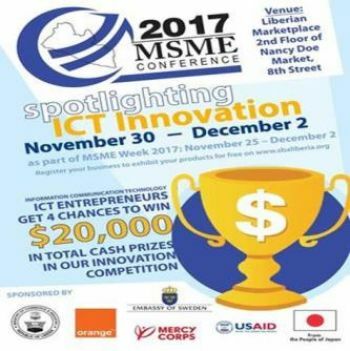 ICT competitors must submit an application to enter the contest and stand a chance at winning one of four US$ 5,000 prizes at https://goo.gl/99vjup. Unsure how to fill out the form? Come visit the recently-renovated SBA’s Business Opportunity Support Services (BOSS) on the Ground Floor of the Ministry of Commerce and Industry, corner of Gurley and Ashmun Streets, Monrovia, and we will help you register your business for the Conference. For more information, visit http://www.sbaliberia.org.